HopHoClock is a straightforward, lightweight and simplistic app designed to help struggling parents teach their children the basic understanding of time spans, encourage responsibility and make discipline fun. If there is anything that can make discipline a tad less boring or tedious, it has got to be an encouragement. HopHopClock is a simple countdown timer with a few customization options ample for a simple a task as to train the youngsters to make their everyday chores, like brushing teeth and getting dressed. Let us see the feature set. What the app does is it shows a visualization of the countdown timer – there is a countdown hour, minute, and second digital clock. 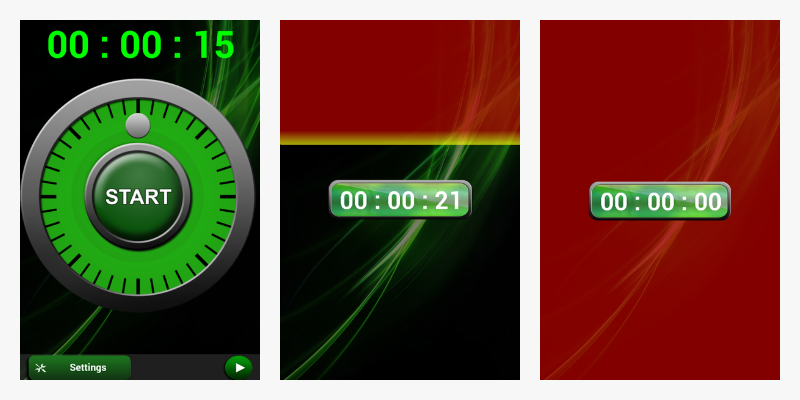 As the timer starts, the screen is green, but gradually the background gets filled with red color while the time runs out. It is a smart way to let kids understand the very concept of short time spans. You can also have the sound effects enabled so that your kids hear the ticking. 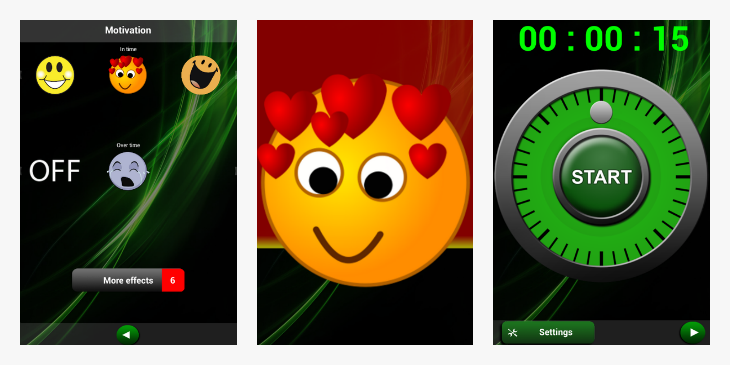 By the time the countdown timer is off, the app displays a sad face, meaning the child did not accomplish the task on time. If your child taps on the timer before the timer is off, the app displays a happy smiley as a congratulation on accomplishing the mission. Hence, the app might change the daily argument of brushing teeth into a fun game, where the kids get rewarded with a merry melody, happy smiley on the screen. Another reward is the happy parents who just avoided yet another blackmail story that a Tooth Fairy is going to get upset if she sees your teeth. Children react to these simple motivational impulses and want to beat the timer, completing otherwise boring chores fast and in a game-like manner. You can customize the ticking depending on the time you need to count. 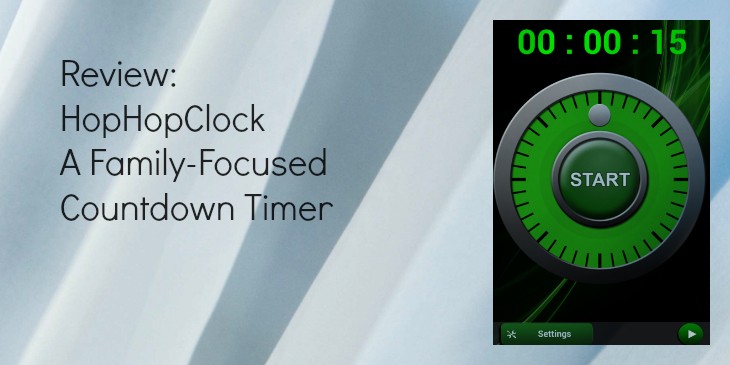 If your timer is set to say, 30 seconds, you can have it tick with every passing second (normal ticking). If your timer is set to 10 minutes, you can choose progressive mode and have it tick once per several seconds. Say, when there are 10 minutes left, the timer ticks once per ten seconds; 9 minutes left – every 9 seconds, and so on until eventually when only one minute is left, it ticks every second. That way, your child does not need to see your device’s screen to know approximately how much time is left. There is also another mode for ticking dubbed the End Boost, which can be used alongside normal and progressive modes. Personally, I find it distracting rather than encouraging, but it depends on the personality type. What End Boost does is it will make the timer tick twice per second when there are only 10 seconds left. Wait, you can use this one when you play board games and want to enforce that crazy rush atmosphere on your opponents. That is, of course, if it does not make you lose focus. Likewise, you can disable ticking altogether, and let everyone focus on their thoughts. You can also choose a happy melody for the mission accomplished case from your device’s media storage. 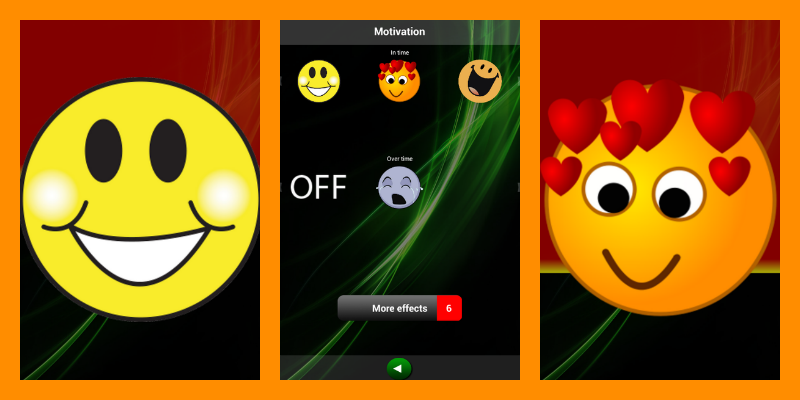 Another customizable feature is the ability to choose happy or sad smileys (default ones are free, but there are some others available via in-app purchases). Motivating kids to finish dinner on time, or to limit their TV time, or moderate computer use when several siblings share the same computer is by far not the exhaustive list of usage cases for a countdown timer. You can use it whenever you need a countdown timer and customize it to sound like a totally serious, grown-up timer you use to cook, do physical exercises, meditate, or when you train for an exam. The UI is simple and intuitive while the design is good-looking. The app does not come loaded with the regular bloat you may usually find in the apps that want to stuff their apps with multitasking features or loads of content. On the contrary, it is clean, uncluttered and sticks right to the point. Touch the timer circle to rotate the dialer and set the timer; tap the start button, and by the time your child is ready with the task, tap the timer to stop the countdown and display the happy, success animation to reward the child. HoHopClock is a case of an ingenious simplicity that works. It is a lightweight, simplistic, non-intrusive family-focused countdown timer that can help parents enforce discipline in a fun way, or help adults themselves in cases when a no-nonsense countdown timer is needed.